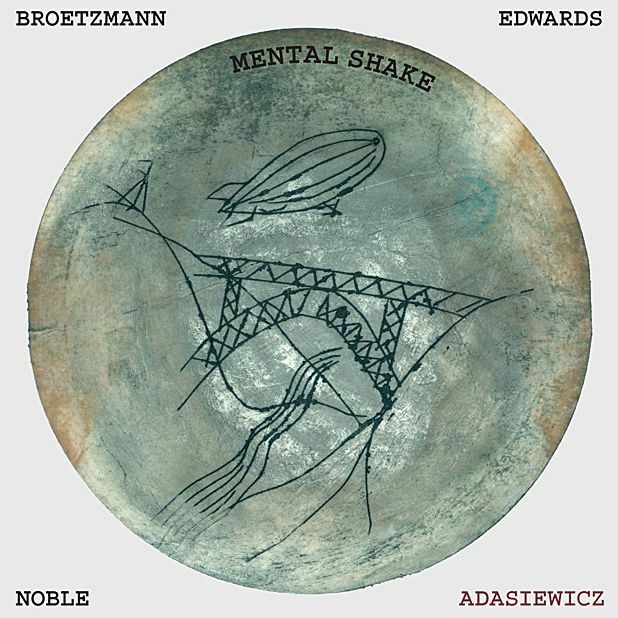 Recorded live at London's Cafe Oto, Mental Shake reunites Peter Brötzmann with the crack rhythm team of John Edwards and Steve Noble. Chicago vibraphonist Jason Adasiewicz is the wildcard, opening up gorgeous purple-blue tone worlds under the Europeans' punky improvisations. It begins with a hunter's call from Brötzmann's Hungarian tarogato pipe, answered by Noble's war drums. Adasiewicz's chords add an air of delicate tension to the juddering groove, which gradually drifts into abstract space music. Brötzmann re-enters on saxophone, his vocalised goose calls leading the group into weirder territory, with sinister groans and wire-on-wood slaps from Edwards' bass and rain-on-tin snare deluges from Noble. Belying his wildman reputation, Brötzmann concludes the set in romantic ballad mode, playing with an unfettered tenderness. Noble brings an edge to it all with impetuous crashes and thumps, drawing snaggle-toothed responses from Brötzmann. A terrific set, full of beauty, wit and bite.